I still remember when I was little, no computer yet in my house (I got my first computer when I started University) but we used to have a typewriter (well, we still do, it´s there forgotten somewhere in a dark place of my house). I had read in the newspaper about a writing contest, sponsored by the government in my city, and I thought it was a hell of opportunity for me. I was no more than eight years old, and decided to enter this contest for ‘novel writers’. I´m convinced that it was just for adults but I didn´t pay attention to it. I just wrote with my typewriter a wonderful story (that shamefully I never kept a copy) of a fantasy world. 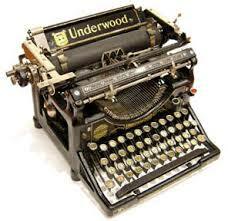 Since typewriters didn´t allow you to make mistakes, my presentation was extremely awful. Being a kid, I wasn´t conscious yet about having to redo a whole page whenever I had a mistake on the typewriter, I would just use an eraser and type over the mistake. When I was done, I begged my Aunt Nancy, who used to live near the post office, to put the papers in an envelope and submit it to the P.O. box of the contest. Of course, I never won or anything and the writing must had been really embarrassing, but I was just eight years old! Nevertheless, having such a wonderful imagination (that I still have fortunately), the story in itself must had been a lot of fun. At that age, I felt there was no limit for me and no barriers to achieve whatever I wanted. What a shame, I was never encouraged to follow these dreams. I wrote short stories for my mom and some members of my family before I was 10. I have a couple of them stored in a box, and of course the writing is terrible but the stories, the creativity, the characters were great. But what I remember the most is that I always felt fulfilled whenever I wrote those stories.That sense of fulfilment shouldn´t be forgotten, we should live our lives with the intention of feeling always like that. However, I did forget it… and it was shameful because it led me to years and years of an unsatisfied and unhappy life….